Work has been completed on a new $73 mil student services building at California State Polytechnic University, Pomona. 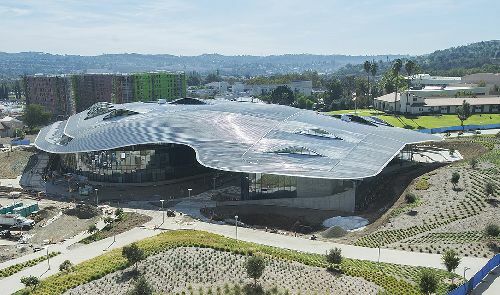 Serving as a new “front door” to the university, the three-story, 138.4k sf structure consists of two buildings beneath a one-of-a-kind undulating roof that uses natural solar power to regulate the building’s temperature and energy efficiency. It was built by C.W. Driver Companies. The new student services building plays a critical role in the long-term development of the university, increases operational efficiency and enables growth. It replaces former student services and administration areas and consolidates key departments located elsewhere on campus. It also will serve as an easily accessible, one-stop service center to facilitate access, increase visibility and streamline operations for students and staff. Inspired by Pomona’s surrounding hills and mountains, the structure’s roof design helped the building achieve its LEED Platinum Certification. Without the use of mechanical and electrical devices, the roof efficiently collects, stores and distributes solar energy in the form of heat in the winter and rejects solar heat in the summer. Designed by CO Architects, the intricate curved steel and concrete roof regulates the building’s temperature through its solid and perforated panels. The roof shades the exterior glass windows, reducing glare and maximizing natural daylight. Cal Poly Pomona, located in Los Angeles County, is known for its hands-on approach to education, with faculty incorporating real-world experiences into their classrooms and teaching theory through application. It is one of two polytechnic universities in California and is a national leader in helping students achieve economic success. The university has approximately 26,000 students.